Lately, when CHS has written about a Chris Pardo project on Capitol Hill, it has involved food and drink. Part of the power duo behind the Po Dog food and nightlife empire, Pardo also has a day job. His PB Elemental is behind the design of a new 4-story 12th Ave project set to take its turn for the first time in front of the East Design Review Board Wednesday night. The 109 12th Ave E project is the third 4-story development we’ve written about in the past week and second on 12th Ave.
Here’s our look at the other two upcoming projects. 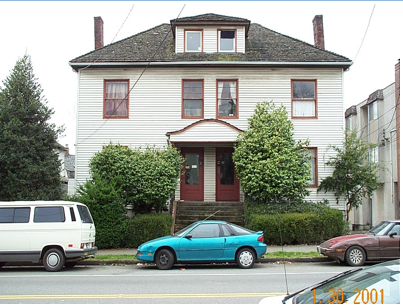 Plans call for demolition of a long-abused 4-plex on 12th Ave E just north of E Denny Way to make room for a 21-unit building to be wedged between an existing single-family style home (now used as apartments) and a 1960s apartment building. Depending on which design alternative the project ultimately moves forward with, there may be no parking included in the plans. Come 2016, the project will be two blocks from the Broadway light rail station. 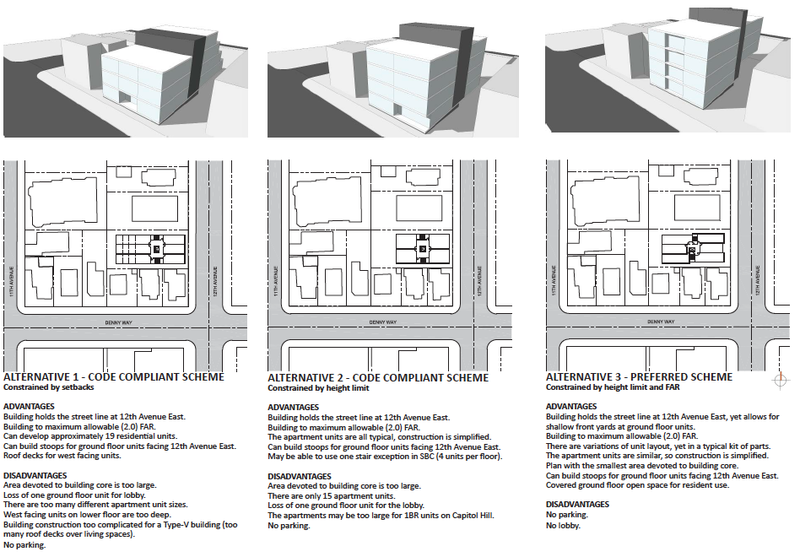 … a new 21-unit apartment building that enhances the vibrant streetscape of 12th Avenue East. Building will be a contemporary model of Capitol Hill living with open plan units, plenty of glass and a recognizable address. 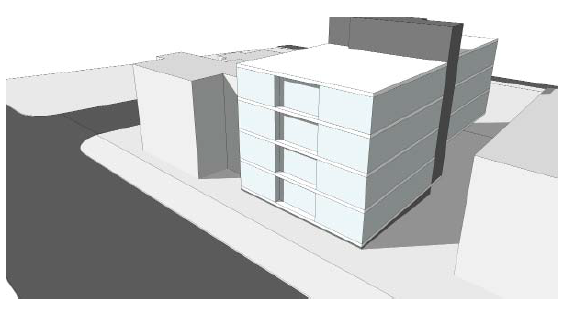 Units will bring loft style living into the context of an L3 apartment building. The parcel where the project is planned is currently listed as “vacant land” by the city though the 4-plex still stands. County records show it has been held by the same landowner since 1986 though it’s possible that any recent sale has yet to show up in the database. You can check out PB Elemental’s other residential work at the end of the design proposal showing early form renderings of the height and massing of the project, below. BRING ON THE MODERN DESIGN! 12th Avenue needs a shot of adrenaline. thank you! Ditto! I’m really happy to have more Pardoism in Capitol Hill. Too bad this project isn’t going to take out the two eyesores to the north of the structure that’ll be demolished. … @ one of the “eyesores” north of the structure. Does the developer realize they are working with an unlicensed and unregistered architecture firm? Does the state know that an unqualified business is presenting themselves as an architecture firm to the public? This is a once gorgeous old home that contributes tremendously to the historic fabric of our fragile neighborhood. The past buildings by this architect are way too modern and don’t fit at all with the gorgeous old buildings of Capitol Hill. We need to stand up for our neighborhood and fight ugly, ugly modern buildings. At the very least we need to have the city force them to add some brick, adobe and a sloped roofline so that the new building fits in. Even better would be if the city rejects this project and forces the owner to fix up the building that already stands on the site. We need to fight buildings like this or before we know it we won’t be able to recognize our own neighborhood. I get the CHS everyday and it seems like often I get that day’s with announcements regarding meetings, etc., (in this case, the 4 story 21 unit building proposal on 12th Ave), the day after. Is there a reason for this or am I missing something? I really would have liked to attend this meeting. My goodness, I would love that. I have lived here, in this eyesore, for the last 8 years and losing my home is a terrible thing even if it is a bit slummy. Thanks to those that own it, it’s remained slummy. When I moved it they told me not to contact them for any fixes – only things that were very important (plumbing, heat, etc). I’ve relaid all new wooden floors here, replaced countless nobs, nails, and even re-plastered a wall or two. I, along with the other tenants have invested at thousands to keep up a property that the owners could care less about. I too lived in that structure for over seven years – I was sad to hear that it was going to be demolished to make way for another block of overpriced condos (which will most likely remain empty). The apartments in the house were passed on from friend to friend, and we did most of our own repairs (except structural). We painted, fixed up walls, stairs, attempted to take care of the grounds, and even dealt with the odd characters that lived in the vicinity.